The end of an era. Three decades of missions came to a close as the Space Shuttle Atlantis touched down in Florida after a 13-day trip to the International Space Station. Here are some of the most amazing pictures of this last mission to the ISS. I am too young to have witnessed the first walk on the Moon by Neil Armstrong and Buzz Aldrin. But I remember the first mission of a Space Shuttle, and I have simulated the launch of the Columbia at least a thousand times with my Lego Starships. It was April 12, 1981. 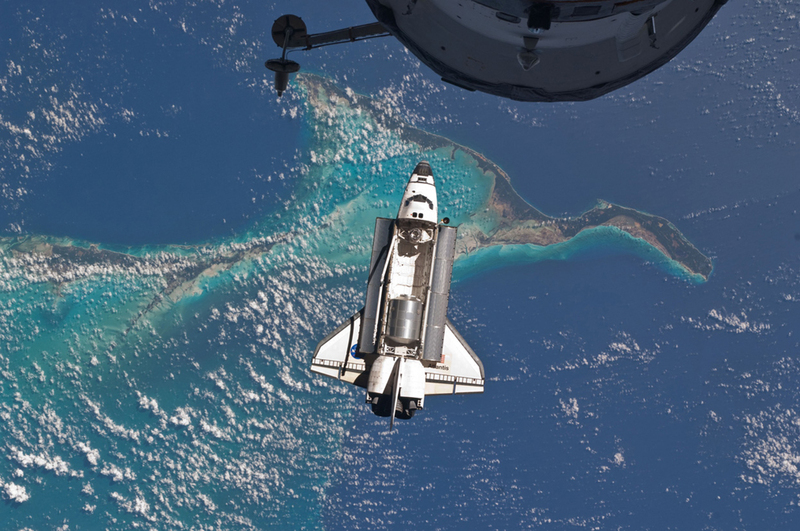 In the picture at the bottom of this page, the space shuttle Atlantis is flying over the Bahamas, prior to its last docking with the International Space Station on July 10, 2011. More pictures and most of the credits for this incredible photo gallery are available on the Astronomy Archives of The Atlantic. Take a look also at the Soviet Space Shuttle — a project from the 1980s’, ended by the collapse of Soviet Union, after only one unmanned flight! However, russians keep flying to the International Space Station from the Baikonur Cosmodrome. Baikonur is a city in Kazakhstan — a former satellite republic of USSR — rented now to the Russian government.